TIP furnaces are designed to manufacture any size of ingots, from 100 g to kilo-bar either in gold or silver. Ingots are obtained by melting pre-weighted grains in a graphite mould placed inside the vacuum chamber and then by cooling appropriately the ingot during the solidification phase. The machine is fully automatic having more than 100 programs for different ingot sizes. The operator only has to load the graphite mould with pre-weighted grains into the holding disk, close the loading chamber and press the START button to launch the automatic cycle. 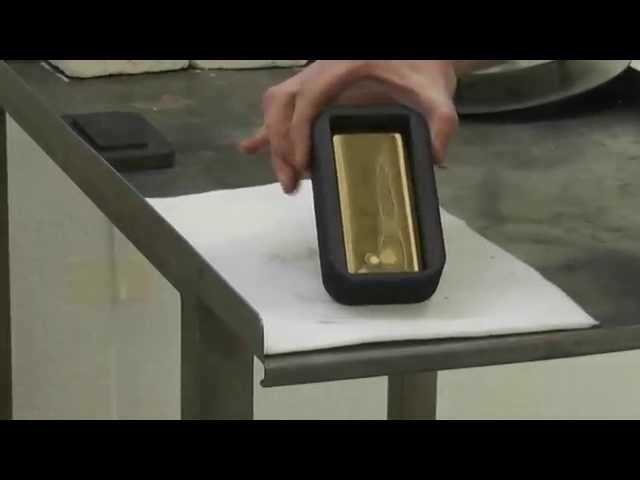 At the end of the cycle the furnace will return the gold or silver bar ready for the market stamp. In order to increase productivity, the system has been conceived with 2 loading chambers and one melting chamber. This configuration allows for melting the next ingot while the previous one is cooling. This overlapped working mode is also important to decrease the running cost of the process because they are mainly related to the graphite mould consumption. A colder graphite mould in output increases the life of the same. The heart of the machine is the induction generator and its coil, designed to maximize the heat transfer during the cycle. After loading the graphite mould, a pneumatic jack will lift the part up perfectly into the center of the magnetic field and the melting step will begin. All melting and cooling process occur in a closed chamber in which vacuum and inert gases guarantee no metal or graphite oxidation. Gas can be chosen between Argon or Nitrogen.